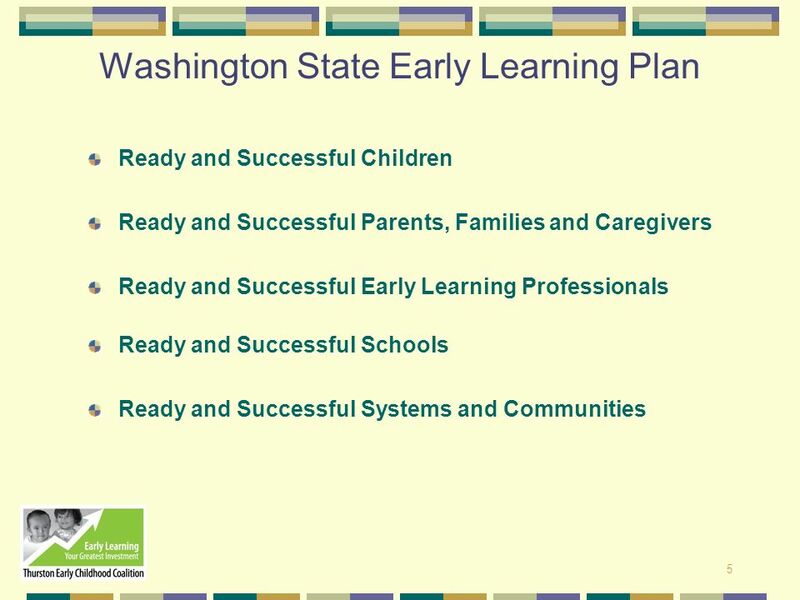 Ready and Successful Children Ready and Successful Parents, Families and Caregivers Ready and Successful Early Learning Professionals Ready and Successful Schools Ready and Successful Systems and Communities Three target populations include: 1. 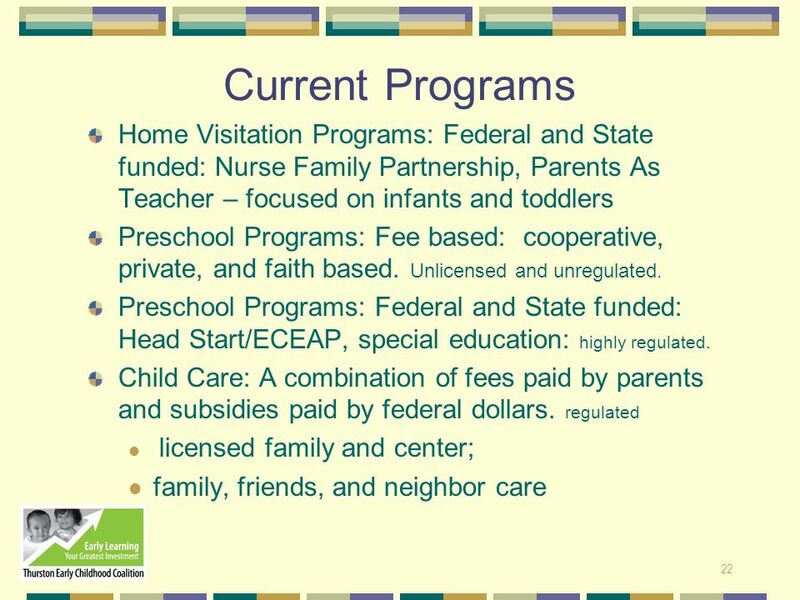 Young children and their families and caregivers. More emphasis will be placed on addressing issues that impact children at risk of entering school unready and thus liable to experience later academic failure. 2. 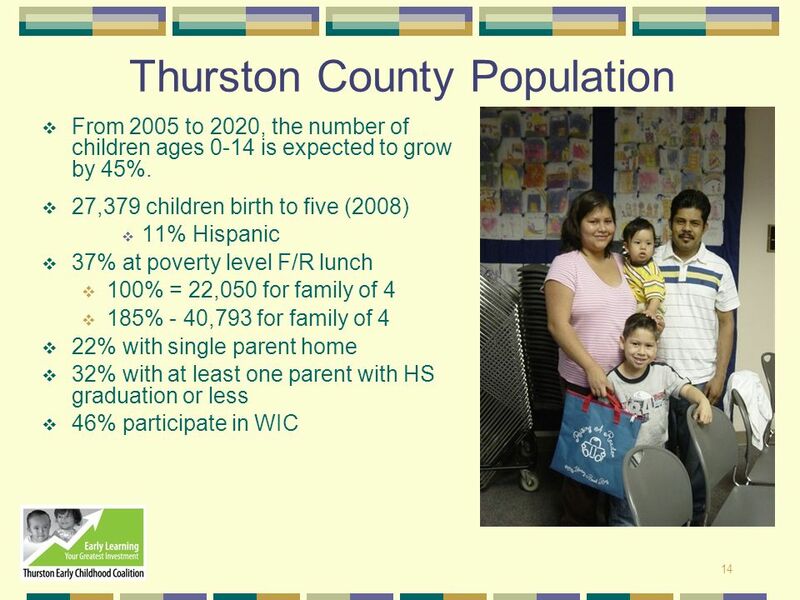 The community as a whole, with buy-in and action throughout the county. 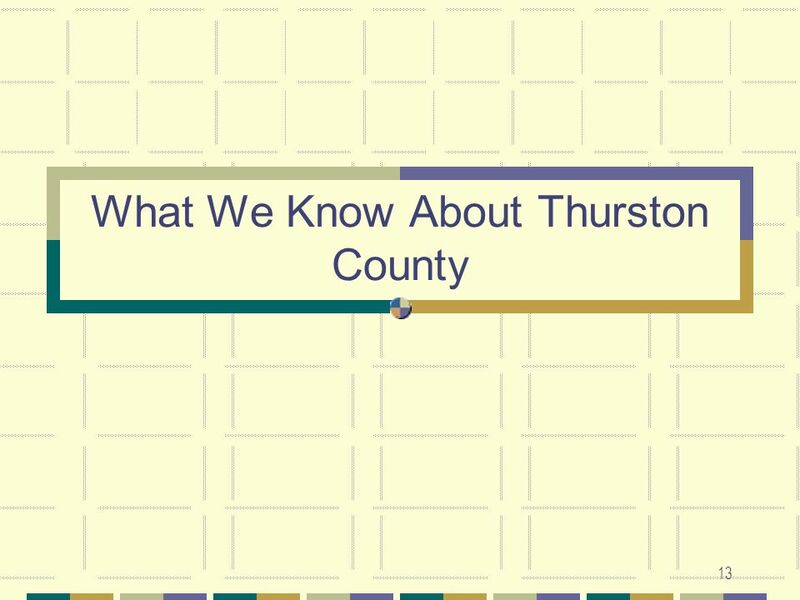 Broad community consensus and commitment through participation in the planning process and formal adoption of the final plan by public and private funders. 3. 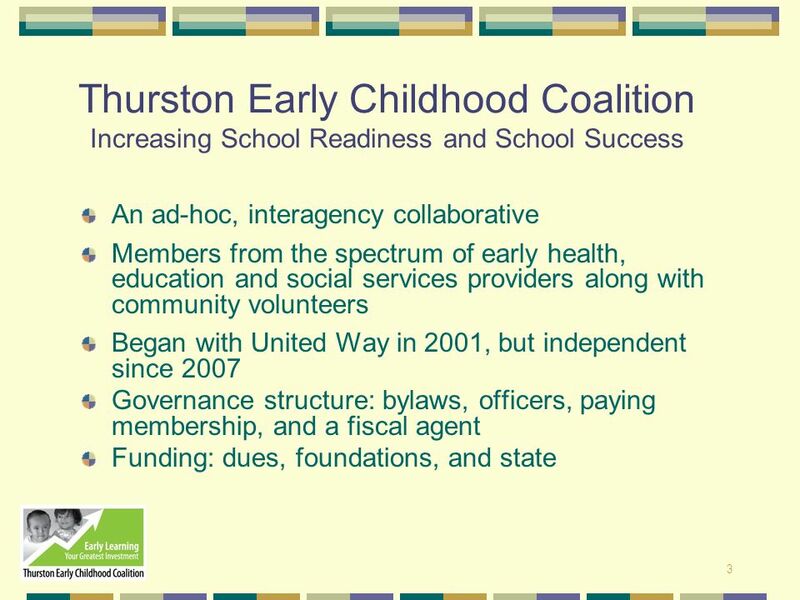 Service providers who “touch” the lives of young children and want to change learning outcomes and opportunities for Thurston county children. 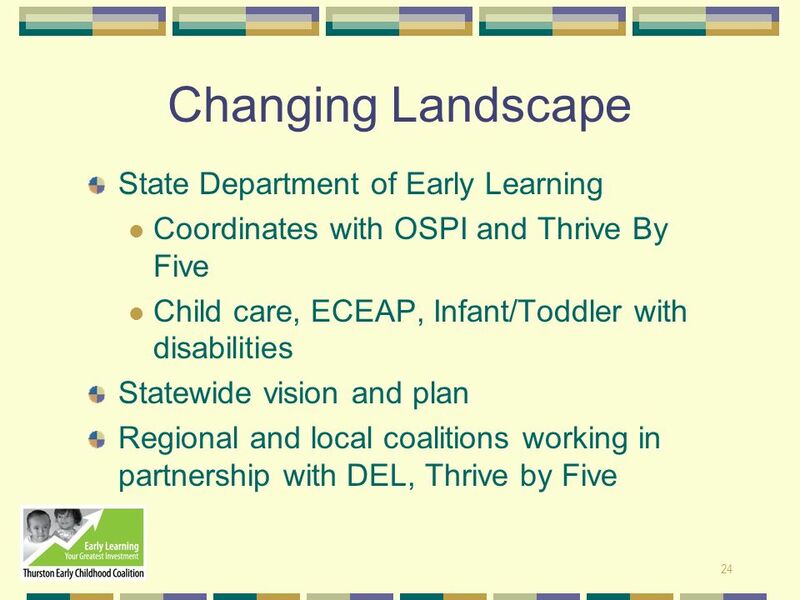 6 Why Is Early Learning Important? 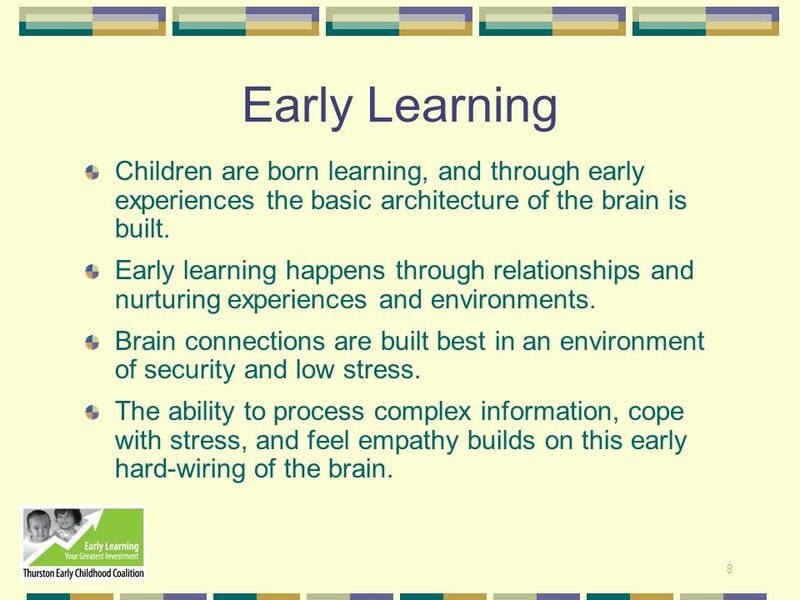 8 Early Learning Children are born learning, and through early experiences the basic architecture of the brain is built. 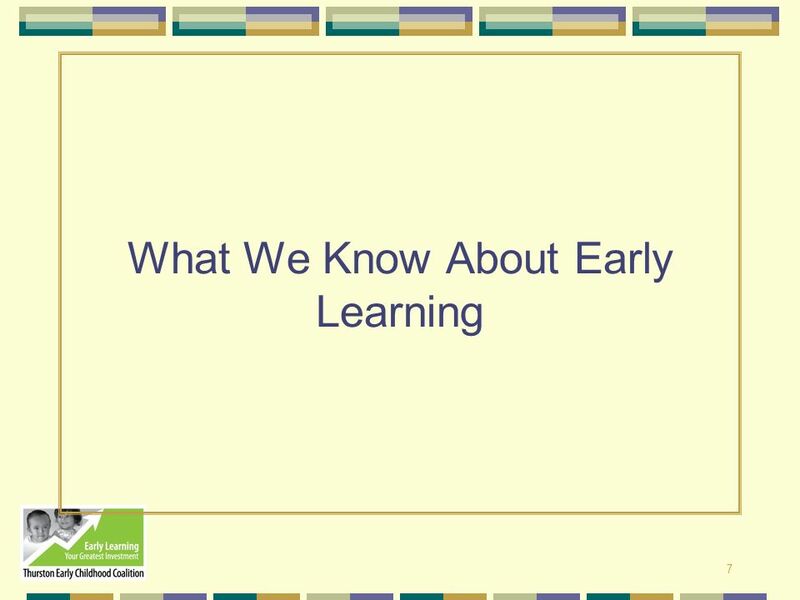 Early learning happens through relationships and nurturing experiences and environments. Brain connections are built best in an environment of security and low stress. The ability to process complex information, cope with stress, and feel empathy builds on this early hard-wiring of the brain. 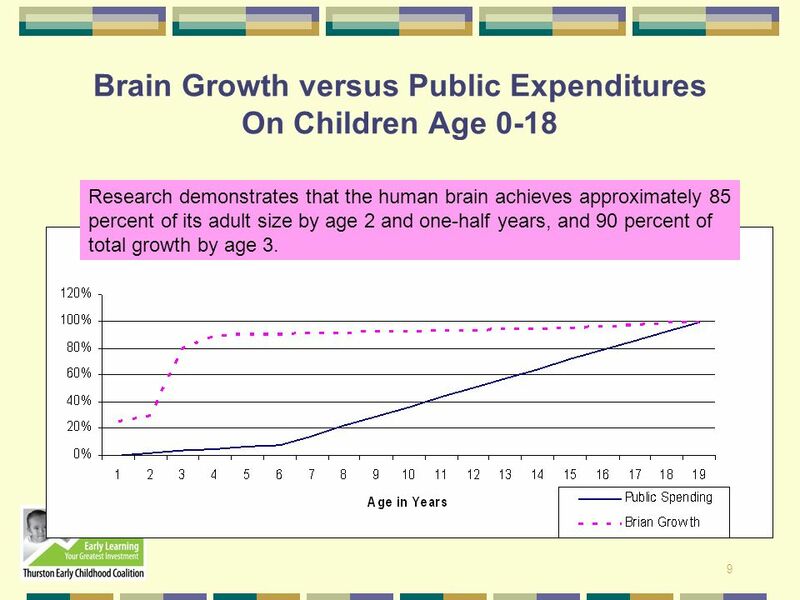 Research demonstrates that the human brain achieves approximately 85 percent of its adult size by age 2 and one-half years, and 90 percent of total growth by age 3. 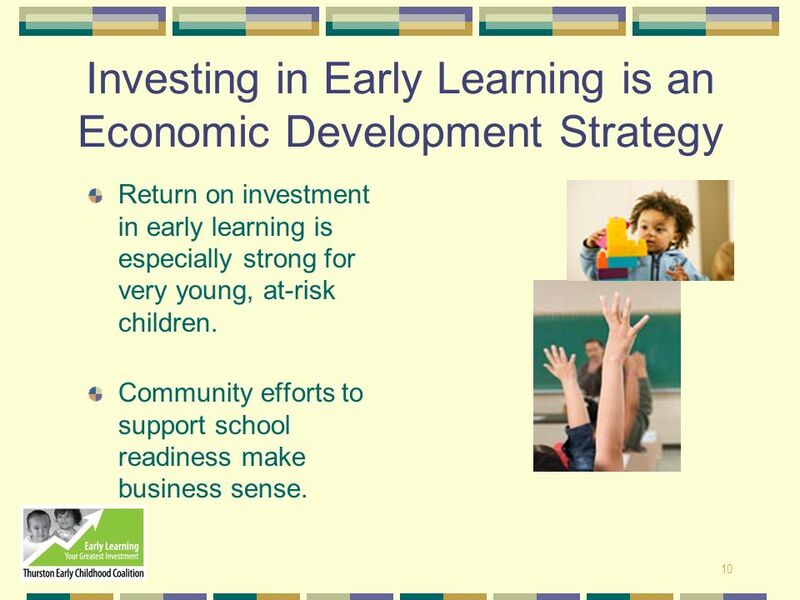 Return on investment in early learning is especially strong for very young, at-risk children. 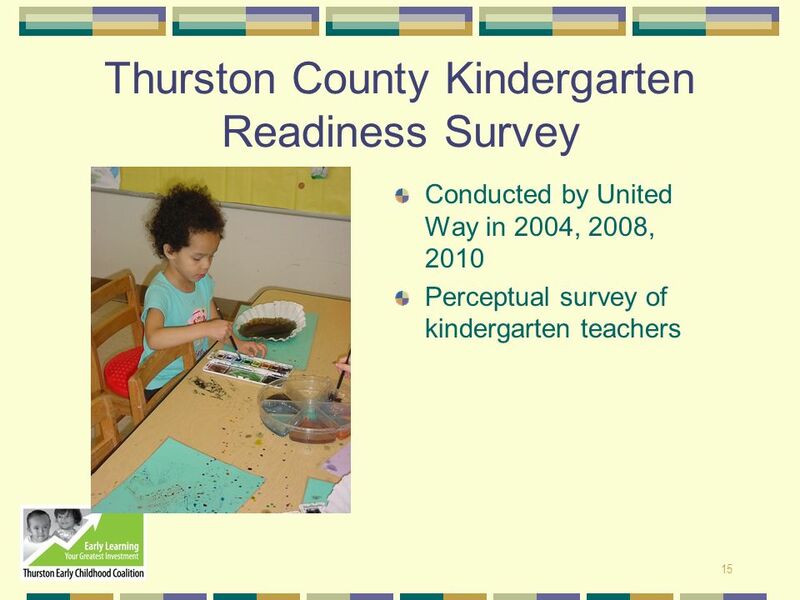 Community efforts to support school readiness make business sense. 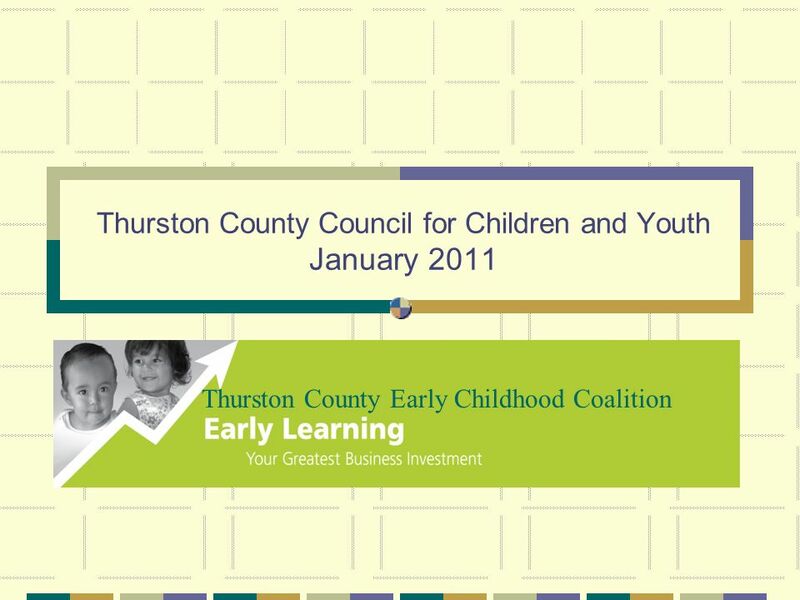 A good start in life is not only critical to a young person’s success, it is an economic investment. 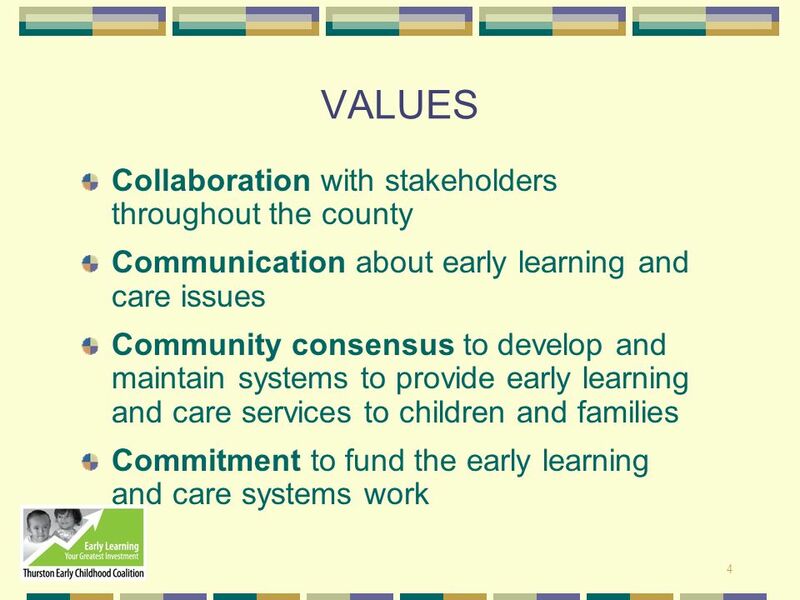 Quality early learning experiences are a foundation for strong schools and a strong economy. 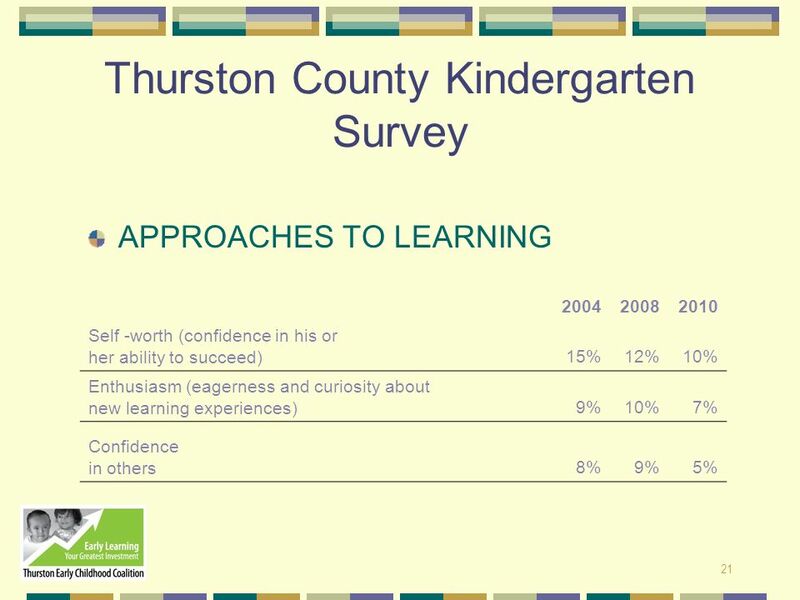 Studies show that children entering kindergarten with skills they need to succeed are more likely to graduate high school, and become productive workers. 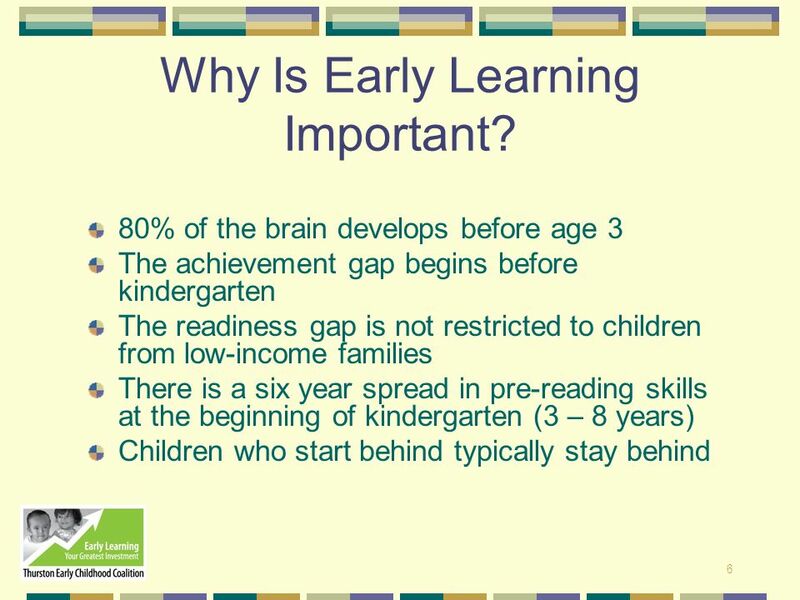 Nobel Lauriat economist James Heckman says “Investing in early education pays off, especially for very young children from low wage families. The return on investment includes higher graduation rates, better job skills, increased home ownership and less chance of criminal activities. 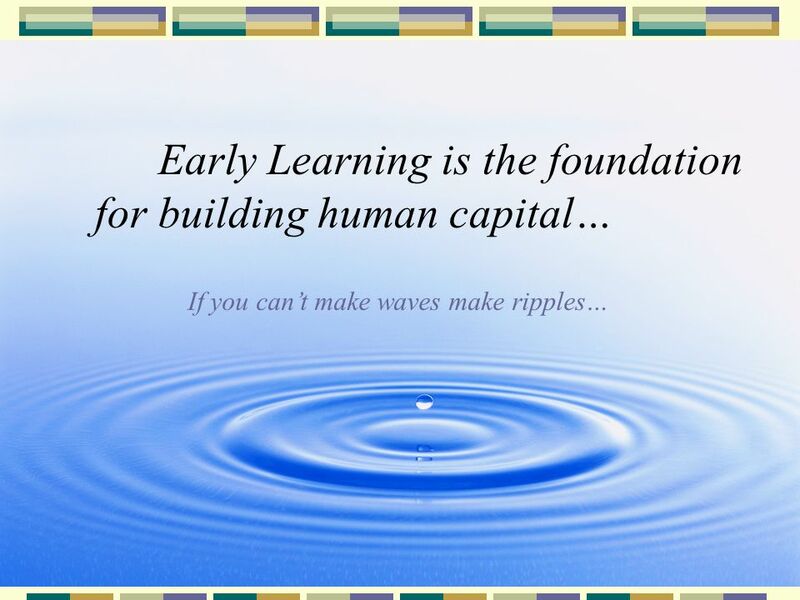 Research conducted by the U.S Federal Reserve Bank found early learning programs could generate a 12 percent public rate of return. Numerous studies substantiate this, many with even higher return on investment rates. 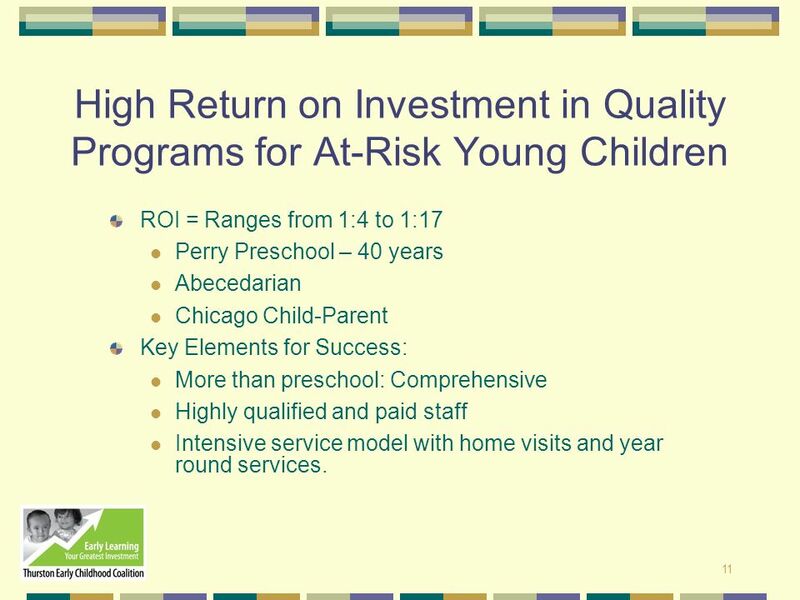 ROI = Ranges from 1:4 to 1:17 Perry Preschool – 40 years Abecedarian Chicago Child-Parent Key Elements for Success: More than preschool: Comprehensive Highly qualified and paid staff Intensive service model with home visits and year round services. 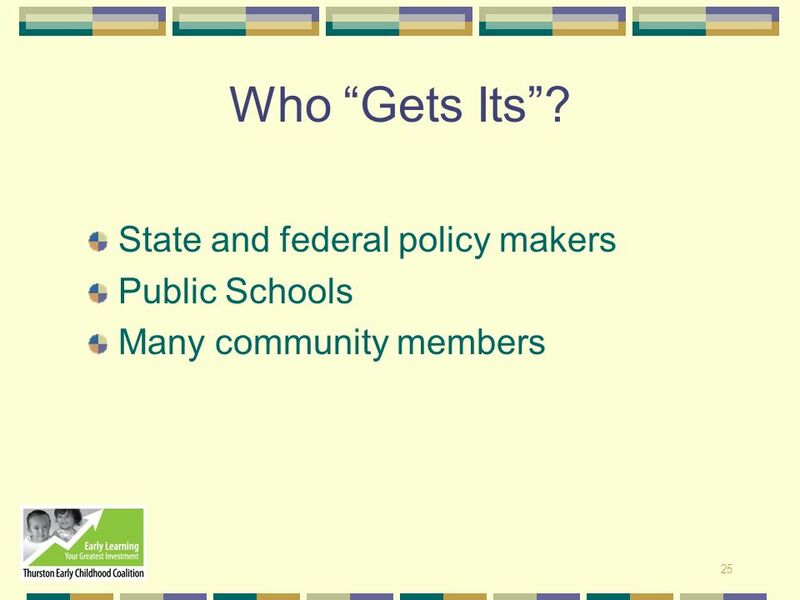 RETURN ON INVESTMENT WITH QUALITY PROGRAMS *Reynolds et al. 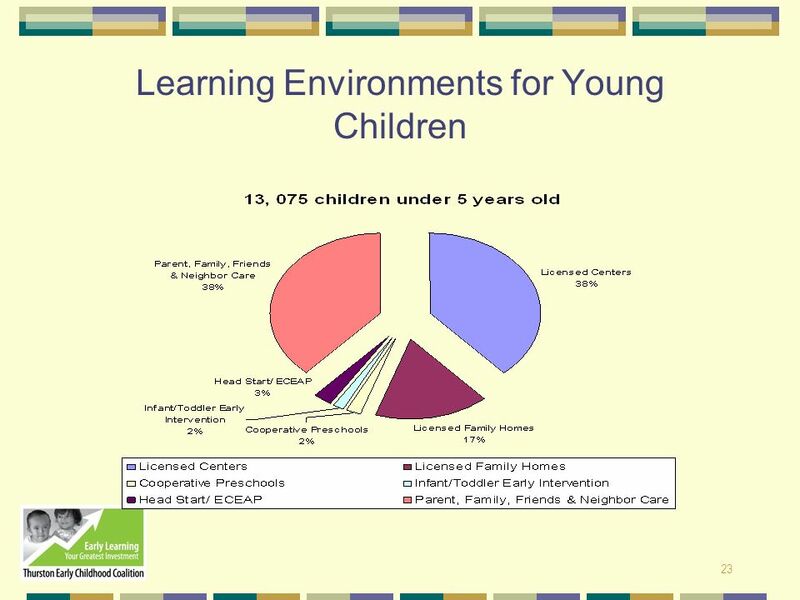 (2003) 17 year longitudinal study in Chicago calculated a $7.14 benefit to society for every $1 invested in children at Chicago Child Parent Centers (n=989) vs. a comparison group (n=550). 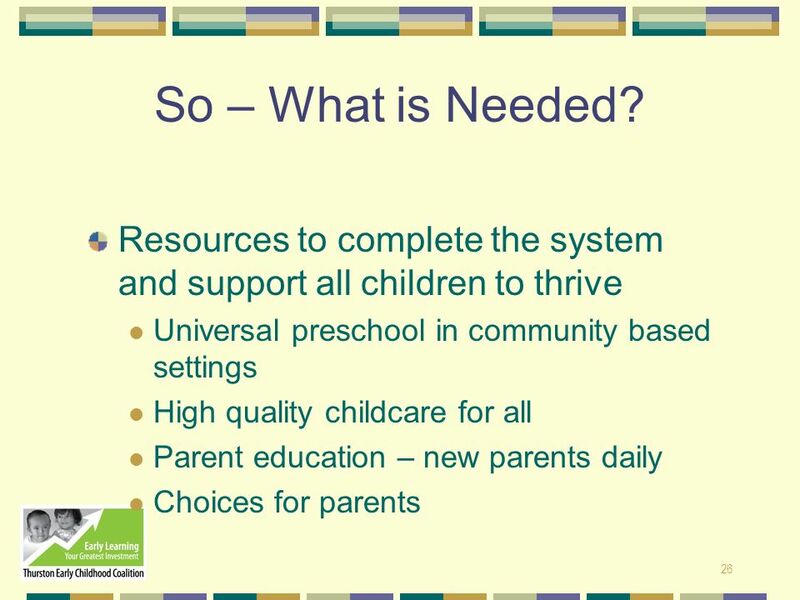 *Rolnick and Grunewald ( Federal Reserve Bank of Minneapolis) analysis of the 40 year longitudinal study of the Perry Preschool program demonstrates a 16% real rate of return on investment with most of the benefits going to the public at large. The total benefit-cost ration was $8.74 to $1, with the public rate of return at 12%. This study of children in Ypsilanti, Michigan, showed substantial differences between the control group and the participants in: *need for special education *graduation from high school *earnings at age 27 *number owning home at age 27 *number of arrests by age 27 *Other studies, including the Abecedarian study in North Carolina, show comparable data. 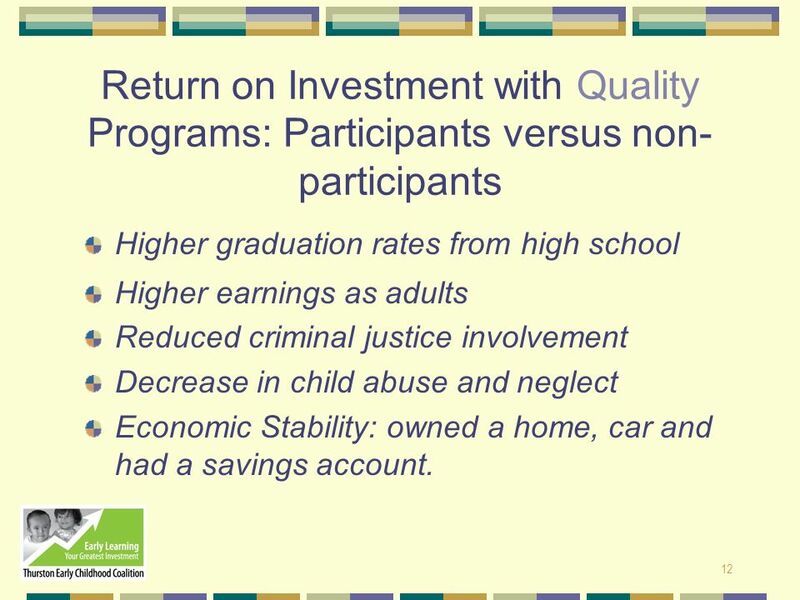 Higher graduation rates from high school Higher earnings as adults Reduced criminal justice involvement Decrease in child abuse and neglect Economic Stability: owned a home, car and had a savings account. This study of children in Ypsilanti, Michigan, showed substantial differences between the control group and the participants in: *need for special education *graduation from high school *earnings at age 27 *number owning home at age 27 *number of arrests by age 27 *Other studies, including the Abecedarian study in North Carolina, show comparable data. 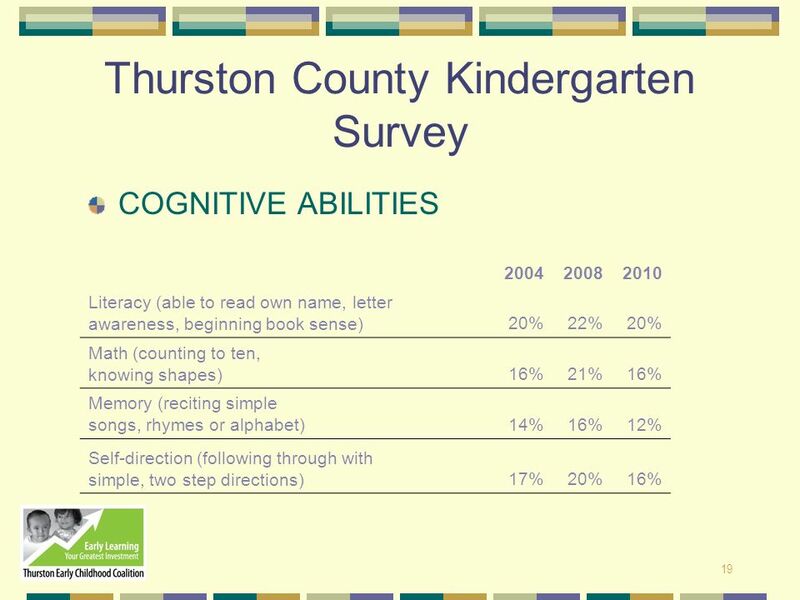 Nearly one in five Thurston County children entering kindergarten have difficulty with: Basic literacy Basic math Self-direction Attentiveness As the population of Thurston County grows and changes, so have our children. 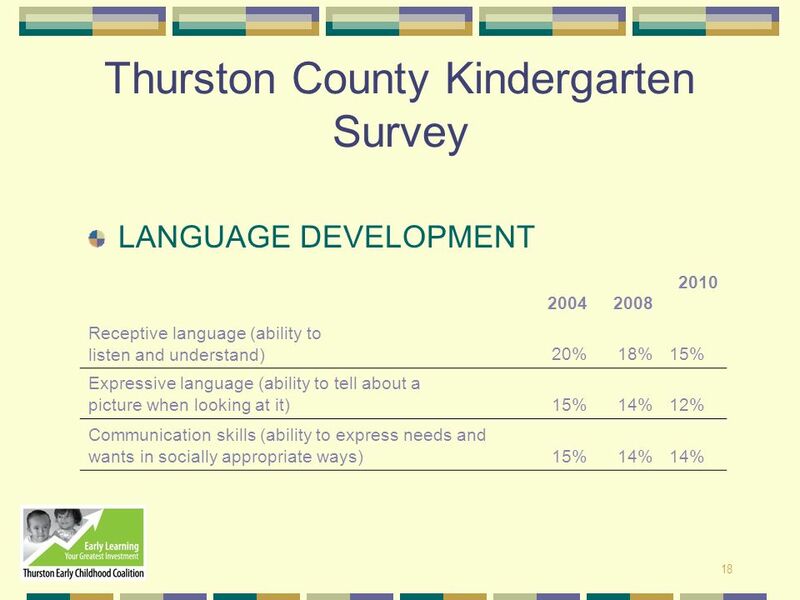 Our local school districts are experiencing an increasing diversity among kindergartners related to the skills they have to begin the learning process. 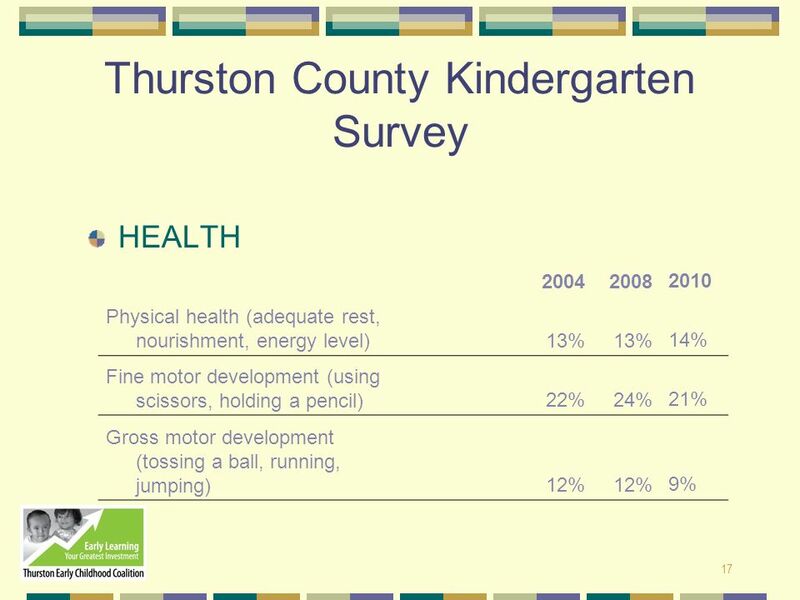 Across Thurston County, nearly 25% percent of this year’s kindergartens do not have the basic skills needed to start the learning process. 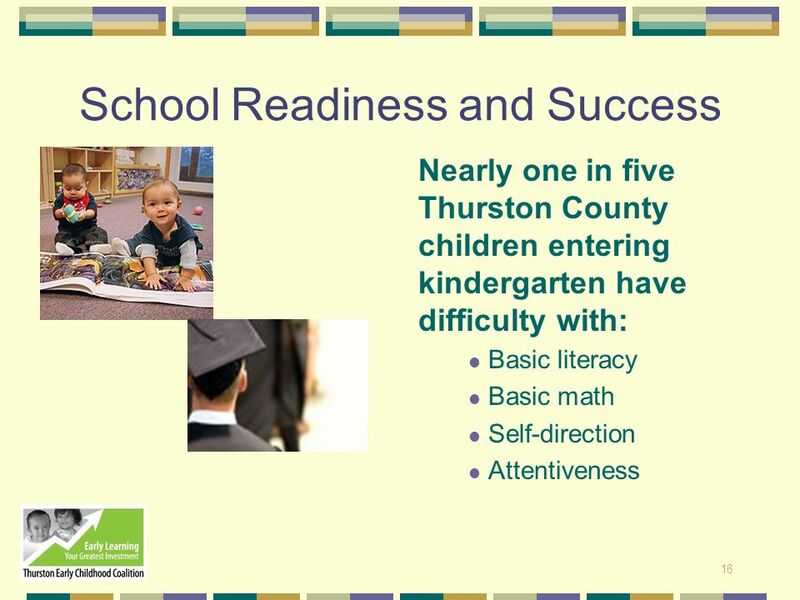 Because playing “catch up” in the early years of schools is difficult, children who come to school without the necessary skills are far more likely to experience failure, drop out of school and become economically dependent on society. .
Download ppt "Thurston County Council for Children and Youth January 2011"
1 Massachusetts Birth to School-Age Task Force Phase 1: Pre Birth to Age Three November 2010. 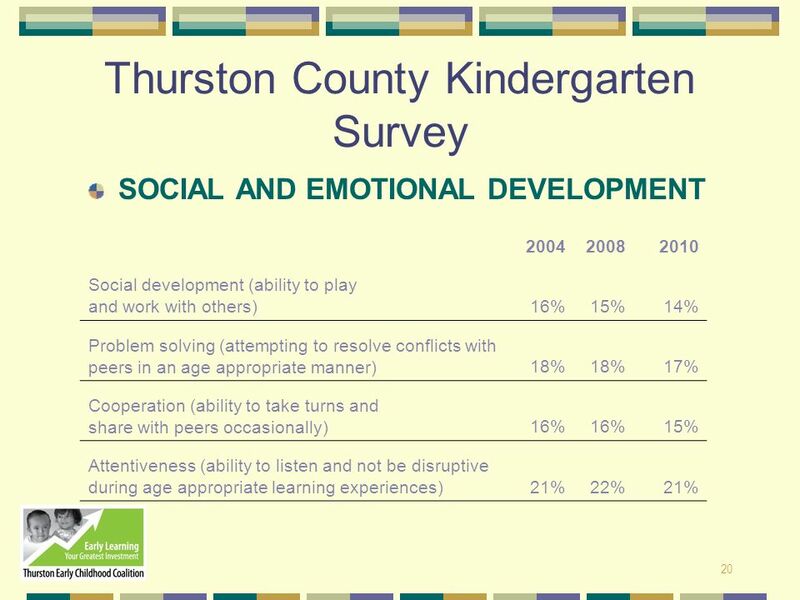 The Case for Early Childhood. BHAG To be a leading social change agent that transformed greater Detroit into one of the top 5 places to live and work.